When it comes to buying a natural stone for your flooring or countertops, you have quite a few options to choose from, including granite, slate, and limestone. While all of these materials are certainly beautiful and sturdy, they do all have different qualities. And these qualities make each of these stones better for certainly applications than other stones are for the same application. If, in your endeavor to buy the best stone for the best purpose, you find yourself unsure of the best stone for certain applications, don’t worry. You can figure out the best stone no sweat thanks to our handy list of three common, different kinds of stones and some of their best applications in your home! Natural stone is beautiful and, above all, HANDY — but only if you get the right stone for the right reason. Don’t risk getting less than the best stone for each purpose. Just read ahead, and confidently put these stones to their best use! We all need to eat, which means that we all need to cook (or try to subsist on a diet of fast-food hamburgers and other crimes against cardiology). Of course, cooking produces two dangerous things in high volumes: heat and bacteria. 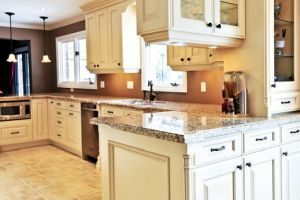 This heat can damage countertops that are susceptible to heat damage, and these bacteria can become infused into some countertop materials, causing illness over time. To avoid these issues, have your countertops replaced with granite. A beautiful and durable option, granite marks out its niche as the premiere stone for kitchen countertops with its high heat tolerance and ability to keep bacteria from entering into it (especially with a sealing). Another commonly used room in your home is your bathroom. Indeed, you might not have ever gone a single day spent in your home without having stepped foot into your bathroom for your cleaning and other such purposes. One danger inherent in your bathroom, of course, is slippage. After all, with all the showering, washing, and all else you’ll do in your bathroom, you’ll likely leave quite a good deal of water about the floor — increasing your risk of slipping and harming yourself. However, you can decrease the likelihood of slipping by installing slate in your bathroom. Slate makes a name for itself as a great flooring option in the bathroom with its natural texture that helps to prevent nasty falls from water on the floor. Limestone is a beautiful flooring option, one that’ll make absolutely any room pop with beauty. However, it proves to be more of a pretty face than a useful material. Why is that? Because, unlike the other stones, limestone is somewhat soft. Thus, it proves to be a poor choice in the kitchen, where you might oftentimes drop heavy and sharp objects, damaging your limestone flooring. And as it does not offer the same slip resistance that slate does, limestone isn’t exactly the best option for your bathroom. Still, limestone is a lovely option, and it’s perfectly suited for rooms in which you won’t be doing a whole lot of taxing activities — rooms such as the living room. In those spaces of sedentariness, you can enjoy all of limestone’s beauty with none of the damage! Whether this list has helped you to decide on granite, slate, or limestone, you need to get a high-quality material so that you can reap ALL of that material’s benefits. And in that endeavor, you can’t go wrong with Kennedy Tile & Marble Inc. We have been in the stone, tile and marble industry for over thirty years now, so you can rely on us to provide you with only the highest-quality product possible!